The views expressed in this blog are soley those of the author. A long time ago, in an industry far, far away… the engineering firm stood at the heart of a subsea / pipelines project and followed the project from the concept definition through to the offshore execution. This produced a generation of ‘pipeliners’ (Jedi?) with both technical know-how and a firm grasp of practical aspects of fabrication and construction. I’ll refrain from further Star Wars references (though there are plenty of parallels with our industry: fantastic technology, impressive diversity, some clone wars, the occasional evil emperor, etc. etc.). It is a fact that the role of the engineers and engineering firms has changed significantly over the past 30 years. Some of these changes have had a positive impact, but others threaten the availability of independent engineering services to the industry. In today’s market, the engineering firm tends to fill a narrower role that focuses on only one phase of the project; typically the front-end phases. This is one result of contracting models such as EPCI that serve to minimize the interface risk carried by the owner by placing responsibility (and liability) for design, procurement, construction and installation with a single main contractor. EPCI and similar contracting models have proven to be effective tools for realizing projects across the industry; however, they result in a break between the early engineering (concept, FEED) and the detailed design and offshore execution. Rarely does the same engineering firm have the opportunity to follow a design from concept through to implementation. As a result, today’s engineering firms have limited access the offshore work-site, and the essential feedback loop from design to implementation is restricted. This was the core message of a presentation I listened to recently at an industry committee meeting. The speaker was arguing that independent engineering firms no longer have a role in the evolution of a project and stated that ‘engineering firms are out of touch with the ‘realities’ of the construction / installation world.’ There is truth to this statement; however, while I would welcome any opportunity to offer INTECSEA engineers more exposure to construction and installation, I don’t expect that any project owner will change his contracting strategy purely for the good of the engineering industry. This being said, I’m convinced that there remains plenty of justification for the existence of ‘traditional’ engineering firms in today’s market and with today’s contracting models. At the root of my conviction is the belief that independence and ‘technology neutrality’ are essential ingredients for achieving the best techno-economical solution for a client on her/his project, and that bias towards a particular product or method detracts from the engineer’s ability to find the right answer. 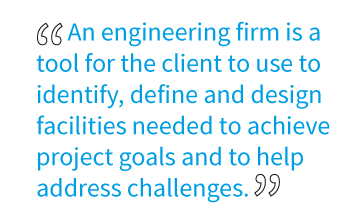 Fundamentally, an engineering firm is a tool for use by the client to identify, to define and to design the facilities he needs to achieve his project goals and to help address the challenges that may arise in the course of implementing the designs. The engineering firm provides the client with expertise he does not have in-house, and supplements a client’s capabilities with a broad understanding of industry capability, technology readiness and risk, and compliance requirements. True independence has become an almost unique trait in the current climate of alliances and mergers. Engineering companies in alliances with construction / installation contractors surely are capable of producing high quality designs. Moreover, the in-house design capabilities of some of the construction contractors are highly developed. Nevertheless, some bias in favor of the technical solutions that are economically favorable for the alliance is inevitable. Such bias may be acceptable on ‘conventional’ projects where one is working within the established technology envelope (i.e. where the impact is purely commercial), but it can be disastrous on technologically challenging and/or frontier projects where the capabilities of the industry must be stretched in some way. There are plenty of examples where technology bias has led to proven designs being stretched and ‘optimized’ for applications for which they were never intended… only to fail during final acceptance testing or, in the worst case, during operation. The client is best served during the early stages of a project by a truly independent engineering firm that can look critically at the options and can develop designs and specifications that address project objectives while maximizing market competition for procurement and construction. The independent engineering firm has access to a large technology ‘toolbox’ with which to promote the client’s fundamental project drivers: safety, quality, schedule and cost. That same engineering firm can support the client during the execution phase (e.g. in the role of Owner’s Engineer or Technical Adviser) to provide continuity and to keep an unbiased eye on the work; thus ensuring that the final design is performed with the client’s best interests in mind. … and as a bonus, the engineering firm gains insight into those ‘realities’ of the construction / installation world for reference on the next project.